The Honorable Wilfred Elrington, Attorney General and Minister of Foreign Affairs of Belize, His Excellency Fernando Carrera, Minister of Foreign Affairs of Guatemala and His Excellency Jose Miguel Insulza, today signed a document entitled Roadmap for Strengthening Bilateral Relations in 2014 at the headquarters of the Organization of American States in Washington, D.C. 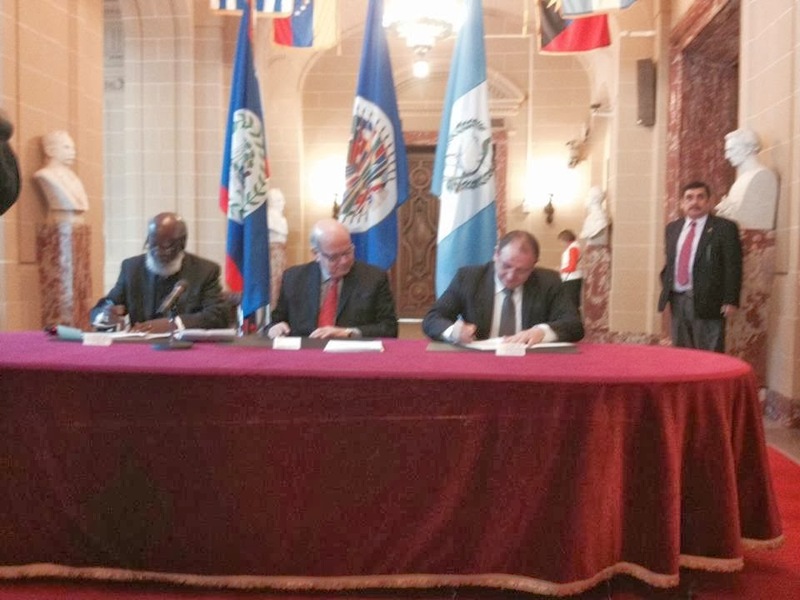 The signing of this important undertaking took place before Ambassadors and representatives of OAS member states. The Roadmap identifies specific aspects of the Framework Agreement for Negotiations and Confidence Building Measures between ‪Belize‬ and‪ Guatemala‬ and other measures that the parties will focus on for implementation in 2014 with a view to promoting peace, security and cooperation and an environment conducive to the holding of the agreed simultaneous referenda that was postponed in October 2013. The Roadmap should also contribute to the management of bilateral relations between Belize and Guatemala until such time as Guatemala’s claim to Belize is finally and definitively resolved. Some of the specific outcomes include the creation of a Belize-Guatemala Joint Commission which along with the support and participation of a representative of the OAS Secretary General, will promote and develop cooperation programmes. The Belize delegation was headed by H.E. Wilfred Elrington and included Chief Executive Officer in the Ministry of Foreign Affairs H.E. Alexis Rosado, Senator Lisa Shoman, Representative of the Leader of the Opposition Belize’s Ambassador to Guatemala Senior Ambassador H.E. Alfredo Martinez, Belize’s Ambassador to the US and Permanent Representative to the OAS, H.E. Nestor Mendez and Minister Counsellor Ardelle Sabido.